Defence Minister Christopher Pyne and Defence Industry Minister Linda Reynolds have announced that the completion of a major capability upgrade to the Hobart Class Destroyers will allow NUSHIP Sydney to enter into operation one year ahead of schedule. 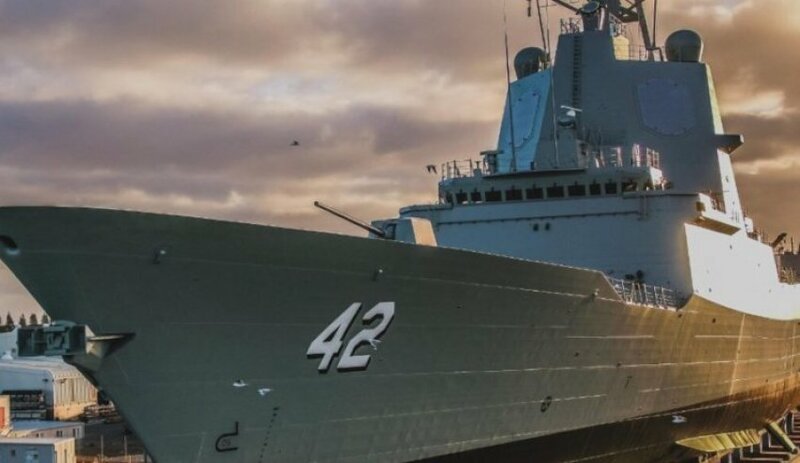 Minister Pyne said Defence was able to streamline a technical upgrade to the third ship of the Hobart Class Air Warfare Destroyer during its build at the Osborne Naval Shipyard in South Australia and fast-track its operational schedule. "Structural modifications to accommodate the MH-60R ‘Romeo’ helicopter into the Hobart Class were planned to be completed after operational acceptance trials, but an opportunity was identified to bring the aviation upgrade forward," Minister Pyne said. The ship, alongside HMA Ships Hobart and Brisbane, will primarily provide air defence for accompanying ships, in addition to land forces and infrastructure in coastal areas. Australia's Hobart Class guided missile destroyers (DDG) are based on Navantia's F100 Alvaro De Bazan Class of frigates and incorporate the Lockheed Martin Aegis combat management system with Australian-specific equipment to ensure that the RAN is capable of defending Australia and its national interests well into the next two decades. The Hobart Class' Spanish counterparts entered service with the Spanish Navy beginning in the early 2000s, working alongside key NATO and US maritime assets. Minister Pyne added, "The upgrade to the ship’s infrastructure to support the Romeo, the Royal Australian Navy's next-generation maritime combat helicopter, will make it Australia’s most advanced warship." The Hobart Class Combat System is built around the Aegis Weapon System, incorporating the state-of-the-art phased array radar, AN/SPY 1D(V), will provide an advanced air defence system capable of engaging enemy aircraft and missiles at ranges in excess of 150 kilometres. Minister Reynolds said carrying out the aviation upgrade during the ship’s build presents significant value for money. "The opportunity for the AWD Alliance to complete the work while the ship is still in-build is testament to the skill and efficiency of the 400-strong shipbuilding workforce at Osborne," Minister Reynolds explained. The MH-60R Seahawk is the RAN's next-generation submarine hunter and anti-surface warfare helicopter and will form a very important part of its operations for years to come. The MH-60R is equipped with a highly sophisticated combat system designed to employ Hellfire air-to-surface missiles and the Mark 54 anti-submarine torpedo. The primary missions of the 'Romeo' helicopter is anti-submarine warfare and anti-surface warfare. Secondary missions include search and rescue, logistics support, personnel transport and medical evacuation. "It will deliver operational capability to the Royal Australian Navy 12 months ahead of schedule and is another way in which the Australian government is strengthening Defence capability and assuring jobs for Australians," Minister Reynolds said. NUSHIP Sydney is part of the largest regeneration of the RAN since the Second World War. It complements the $90 billion commitment in the 2016 Defence White Paper to further enhance Navy’s capabilities with the Arafura Class offshore patrol vessels, the Hunter Class frigates, and 12 regionally superior submarines, the Attack Class, all to be built in Australia, by Australian workers. The MH-60R and its mission systems replaced the fleet’s S-70B-2 Seahawk aircraft, which retired from service on 1 December 2017. The Australian government approved the acquisition of 24 MH-60R Seahawk ‘Romeo’ naval combat helicopters at a cost of over $3 billion. The helicopters are largely military off-the-shelf built by Sikorsky and Lockheed Martin and were acquired through the foreign military sales process from the US Navy.